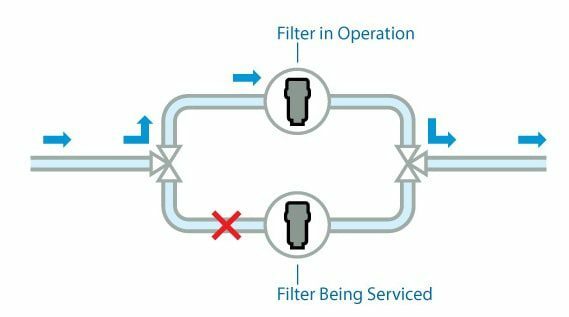 Filters are an essential component of every hydraulic system. Their function is to remove particle contaminants from the hydraulic fluid. These contaminants will reduce the life of system components through abrasive wear. Our filter housings are ideal for all hydraulic filter applications and especially for protecting pressure regulators, servo valves and other low flow sensitive components. Also great for protecting pilot actuator valves and high flow pump discharge applications. We have a range of filter housing for high pressure applications up to 700 bar from stock and to 1500 bar (or higher if you need) available to order. Element servicing without interrupting a continuous hydraulic & lube system operation is achieved by arranging the housings in a duplex formation using a pair of valves. Developed to fit our standard size filter housings these cartridges are from 316L stainless steel and have Viton seals. The welded construction of the cartridge ensures all wetted parts are stainless steel. Stock grades are 5, 25 and 50 micron with other types available to order. We can supply housings with Differential Pressure Indicators, Cartridge Bypass Valves. We also produce housings with magnets and a combination of filter element and magnet.